BSODs are usually caused by third-party drivers or hardware problems. Do a web search with the name of the file and the STOP error to find solutions. Windows often restarts instead of showing a BSOD. The steps below will override this, allowing you to see the BSOD when it happens. Open the Start screen/Start menu, type SystemPropertiesAdvanced.exe and press ↵ Enter. Windows XP: press ⊞ Win+R, type sysdm.cpl and press ↵ Enter, click the Advanced tab. Under system failure, uncheck automatically restart. Press OK to save the change then close the remaining windows. 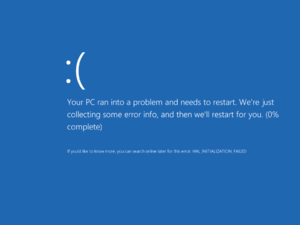 Download and run BlueScreenView to examine the BSOD minidump. The highlighted files (if any) give an indication of which drivers contributed to the crash. Doing a web search for the Bug Check Code will often lead to someone with the same problem and hopefully a solution. Searching for the STOP values is also helpful. If the file that caused the crash is part of a third-party driver or program, consider reverting it to a version that was working in the past or updating to a newer version if one exists. If that doesn't resolve the problem you could also try uninstalling it altogether. If the different Microsoft websites don't show up in your search, it might help to search Microsoft Docs for your error name. Finally, if you are unable to find any info on your specific situation, your next best bet is to find a reputable and thriving tech website with a forums, or a website focused on troubleshooting computers. Start a thread, outline your specific BSOD, current rig, and hope that somebody will help you. Manually setting the RAM's clock value in the BIOS might stop any BSODs from happening.